Save gas while you stay at Hermann Hill Bed and Breakfast. 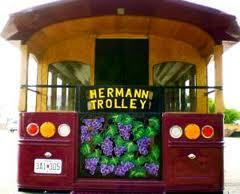 One of the great things about Hermann, Missouri is the Hermann Trolley. You won’t need to use your car once you get to our Hermann Missouri bed and breakfast because the trolley will take you everywhere. Use the Hermann Trolley as your designated driver to five of the wineries in the area. During the tour the guide will show you different places for lunch, dinner and shopping. They will even drop you off and be back to pick you up. If you are traveling to the Hermann area by train, the trolley will pick you up at the Amtrak Station and take you right to our luxury bed and breakfast. Experience the Hermann Trolley…you’ll love it!